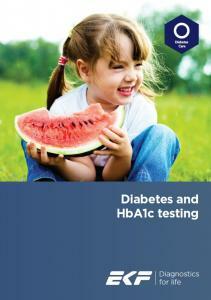 EKF Diagnostics have published a guide to ‘Diabetes and HbA1c testing’ which can be found on our new Diabetes Portal (www.ekfdiagnostics.com/diabetes-portal.html). This new educational guide draws on our expertise in the diagnosis and monitoring of diabetes and associated conditions. It provides an overview of the global diabetes ‘epidemic’, symptoms and complications, through to discussion on methods for diagnosis and monitoring using both glucose and HbA1c testing, with consideration given to factors influencing their measurement. There are multiple options for the diagnosis of diabetes, most of which involve measuring the level of glycemic control a person exhibits. In addition to methods such as fasting plasma glucose and two hour plasma glucose, another option is to use glycated hemoglobin (HbA1c) which reflects average plasma glucose over an 8-12 week period. In addition to lab-based testing, WHO has approved HbA1c for diabetes diagnosis with a Point of-Care-Testing (POCT) device, providing the test is undertaken by a trained professional adhering to an appropriate External Quality Assurance scheme and using a methodology traceable to the IFCC reference method.2 POCT HbA1c testing gives a strong indication of both diabetes and pre-diabetes within a timeframe that enables immediate intervention. Since it is not impacted by the same issues as blood glucose monitoring, HbA1c testing is fast becoming the preferred technique for diabetes and pre-diabetes diagnosis and monitoring. There are situations where use of HbA1c is not appropriate though. EKF’s new Guide includes discussion on both glucose and HbA1c testing and where factors may influence measurement of both diagnostic markers. EKF’s expertise and product range cover all aspects of diabetes care, from research and hospital laboratories to diabetes clinics, emergency rooms and GP surgeries. Products include the Biosen C-Line glucose analyzer, which uses chip sensor technology to provide low cost, fast and lab accurate glucose results. Quo-Test® and Quo-Lab® point-of-care HbA1c analyzers that deliver results meeting NGSP and IFCC POC requirements in four minutes. And lastly, to aid the diagnosis and monitoring of diabetes related conditions such as ketoacidosis, EKF offers Beta-Hydroxybutyrate LiquiColor® Reagent and the handheld STAT-Site® M β-HB strip-based analyzer. Use of glycated hemoglobin in the diagnosis of diabetes mellitus. World Health Organization (WHO); 2011.